Sunday morning, March 30th -Â Â Three weeks before the Boston Marathon. Twenty two people assembled in the parking lot behind Brueggers, 16 runners, 2 drivers, and 4 little helpers, all instrumental in pulling off the Hopkinton to Boston College long run road trip. At 7AM we packed three minivans and one car with waterstop supplies and people and headed out on the road. At 8AM we pulled into Hopkinton and all got in line for the bathroom. Thank you to the Hopkinton Cumberland Farms for allowing us to make one last pit stop before our run. 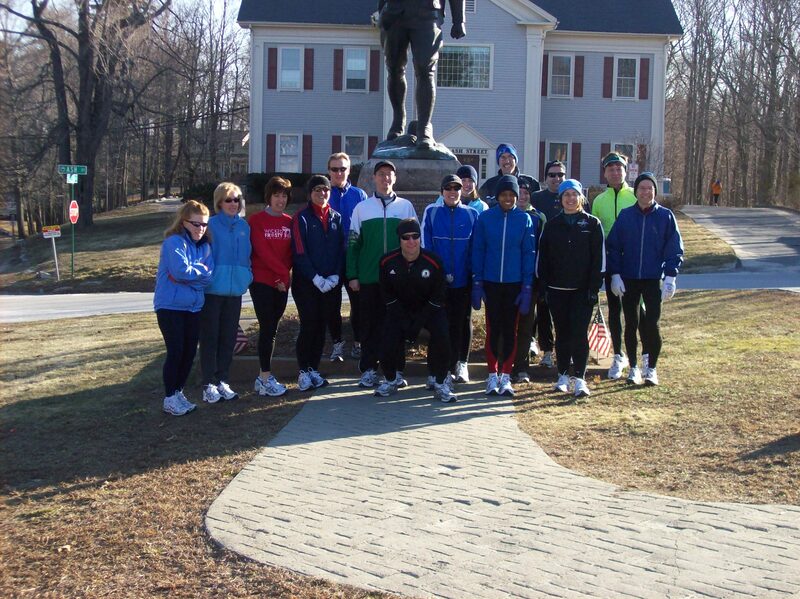 A few moments later we were all assembled at the Doughboy Statue at the Boston Marathon starting line. A quick picture and off we went, 14 of us running east into the wind and the 29 degree country air. Barry, Sue, Joanne, and Ginny with the kids passed us on their way to their waterstop duties, each with a beep and a wave. HOPKINTON – The pack lined the left side of route 135, spreading out in its usual groups. Judi and Erin took the lead, Brian kept pace right behind, Walt, Ed, Andy, Mike, Jim, Tracy, Nick, and Erin Lynch watched as they pulled away. Nancy, Lois, and Pam kept pace right behind. Walt warned us of our fast pace along the way, as the 2 mile downhill helped us along past the MetroWest Daily News Sunday Papers sitting in the driveways of our host cities sleeping residents. His vigilance in reminding us to slow down would pay off. ASHLAND – Into Ashland we hit our first set of hills. These are not well known, as everyone says “Boston is all downhill for the first 16 miles”, but everyone noticed them. In short time we were at water stop 1 where Ginny, Gavin, James, Kaitlin, Lizzie, and Barry made quick work of attending to each runners needs as we zipped through and on our way through Ashland. FRAMINGHAM – A few miles further down the road we are suddenly following along side the train tracks of Framingham. The roads here are flat so runners begin to find their pace for the day… at least the increasing numbers of runners out on the route wizzing by us had found theirs. This is a runner friendly stretch, except for the running jacket eating telephone pole that took a bite out of Mike as he passed by. Pulling into water stop 2 Sue and Joanne informed us of the traffic that would plague them for the day. Today, one of the busiest day to run along route 135, second only to Patriot’s Day, the Human Rights Torch Relay was making its trek down the middle of road in front of us. Having started a half hour before us, moving at a pace that divided our faster runners with the rest of us, and collecting a trail of irrate drivers behind it, this would hinder all our water stop cars as they raced Judi and Erin to Boston College. A noble cause, sure, but we weren’t ready for this. NATICK – Still following the train tracks, we resumed our comfortable pace through the downhill and flat sections of Natick. We passed Lake Cochituate where marathon lore tells us one of the top runners of the 1930s, Tarzan Brown, once took a quick dip to cool off during his run on a hot marathon day. None of our runners considered that, as despite the expected warming trends the air temperature was still hovering in the low 30s. After the lake we passed the Natick Animal Shelter where kennels full of excited dogs erupted in barking as runners passed by. They may have been cheering… or they may have been expressing their desire to nip at our heels. At Natick Common, our third water stop erupted in similar cheer as we pulled in to the sounds of “Water Stop, Water Stop, Caaaaaandy!” led by Ginny, accompanied by Sue, Joanne, Kait, Lizzie and Gavin. Lois and Pam were treated to gymnastic entertainment provided by Lizzie. Pam finished her 10 mile run here, recovering from a nasty viral cold, she had a successful return to running today. WELLESLEY – Further down 135 we enter Wellesley, half expecting the high pitched, high decibal screeches of Wellesley College which make this the most memorable and quickest stretch on marathon day. Despite the lack of any noise, this still seemed like the quickest stretch for me. As the train tracks rose along our left side and the college passed by on our right, it seemed like no time before we pulled into water stop 4 where Barry and James waited along the bench lined sidewalks outside of Brueggers. Sue pulled into the stop with me, as if she had run the 13 miles to get us here, but she was just warming up to start the 9 mile stretch from here to Boston College with Joanne. Erin Lynch finished her 13 miles at a nice strong pace to step into the role of water stop assistant further on down the road. NEWTON LOWER FALLS – Through Wellesley Center, across route 9 into Newton Lower Falls, runners experience the drop to the lowest part of the course. This is where we noticed the fatigue building up in our legs. Ginny gave us a quick update on the progress of our fellow runners. Walt had caught up to Judi and Erin, his conservation of energy at the start had paid off. Brian had trailed back a bit, while Andy and Ed were right behind. Ed was nursing a blister but charging along. Mike, Tracy and I were in a tight pack. Nick followed in right behind us, bringing his run to a close at 16 miles. Nancy, Sue, Joanne, and Lois were not far behind, making good time on this difficult course. This water stop featured breakdancing by Gavin! NEWTON – As the water stop attendants headed into Starbucks for some Frappacinos, we headed over route 128, past Woodland Golf Course, and turned right onto Commonwealth Ave. Up the first hill we went and road a long downhill for a while. Erin caught most of us for our last water stop of the day, although the Human Rights torch run kept her from helping the front runners. WE enjoyed our candy, water, and gatorade across from the Johnny Kelley Statue, slowly sipping and considering the hills we had left to run. There was no putting it off any longer though, up Heartbreak Hill we went, and then another. Cresting the hill we were whipped by a cold ocean breeze. This made obvious the fact that the temperature had been perfect for awhile… up to this point. Usually the end of the run is the warmest part, but suddenly my face turned cold, winter wasn’t giving in quiet yet. Neither were we. With the Prudential Building visible in the distance, reminding us that we wouldÂ have a long 5 miles ahead of us on marathon day, we rode the last downhill to the campus of Boston College. As runners filed in from the long run we spread our tired bodies along the sidewalk and grass across from St Ignatius Church at the college. A fewÂ runners noted how far down the decent to ground level felt after 22 miles. Sipping coffee, trading stories, and mocking each other’s awkward tired movements we regained our energy on Graham Crackers and gluten free pretzels. Sue came running in and asked where Heartbreak Hill is. For the second year she didn’t notice any big hill along the way. She ran back out to look for it again. When she returned we explained that she needed to go out to Hopkinton and run back, then and only then could she find Heartbreak Hill. It really isn’t all that big of a hill, we run bigger hills every week, but believe me 19 miles into a run its as big a hill you’ll ever want to meet! So that’s it, 295 miles spread across 16 Sunday Long Runners between Hopkinton and Boston College. Who is gonna make it? This long run, we all did. The plan is complete (almost). I have a sheet explaining who is going to be where and when. The only wildcard left is whether Pam can run or not (she has been sick). If she does come, we’ll include her car in the mix, if not, the 3 minivans are full! WE’ll all meet prior to 7AM at Brueggers so that the tires are ready to roll at 7AM! This ensures that ourÂ legs are rolling by 8AM. On the way into Hopkinton we’ll be stopping at a gas station just prior to the starting line. Its on the left at an intersection, I think it’s a gulf. This will be your last official spot to use a restroom until the finish, although remember Churches and Fire Stations are a runners best friend. In advance, a huge thanks to Judi and Andy Pate for the use of their minivans for this. And a huger thanks to Barry and Ginny for driving those vans. Your contributions to everyones marathon training is greatly appreciated. It will be chilly at the start of the run. Dress appropriately, you’ll be able to shed layers at the water stops along the way. EnjoyÂ your run. Remember this is a training run, itÂ is not the Boston Marathon. This is a tough course and it can take its toll on you, so run it as a training run not as a race. Although we don’t have access to any facilities at the finish, there is a coffee shop across from the church we used to freshen up and put on some dry clothes after the run. I suggest you bring at least a change of shirt along for the ride. Any other thoughts or suggestions for tomorrow for those who have done this before? Post them here! I’ve posted the long run map. You’ll notice the full route is only 21.5 miles long. When plans get finalized we’ll look at possible moving the end of our run down to Cleveland Circle to get the full 22 in. If that doesn’t happen (parking logistics could be an issue) a loop around the Flynn Recreation Center on the BC Campus will get you 22 miles. At this point I think we’ll have at least 9 runners doing most if not all the miles, 3 running a portion of the route, 2 fulltime waterstop drivers, and 4 young volunteers/spectators helping us along. Now if you’re feeling overwhelmed… it’s just seven 3 mile runs, sounds simple. I posted a note on the MRC forum about this. This week we’re looking for support from runners who want to run part of the marathon course and can drive the support vehicles for the other portions. There is quite a bit of organizing needed to figure this out so the sooner I know who’s in, the better the planning will be. Either send me an e-mail or post here if you can help our band of marathoners get in their last big training run of the 2008 winter training session. Also, let’s start an early roll call here so I know how many empty seats we’ll need to get people out to Hopkinton and back from Boston. If you’re getting ready to join in on the Sunday Morning Long Run, well, you missed it. 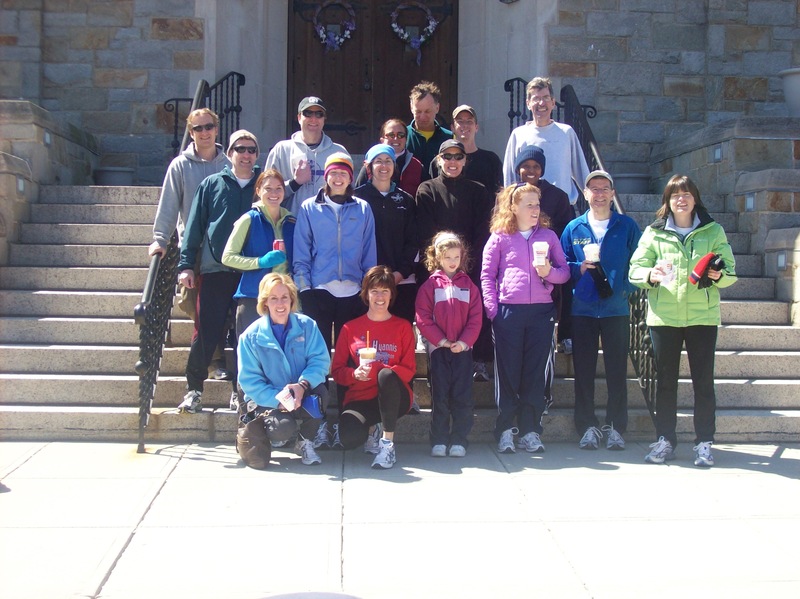 Today at 8AM many of us met for the Easter Edition of the Sunday Long Run on Saturday. With Erin’s car poised at water stop 1, and Nick and Rick ready to man their spots along the route to help us through the miles, the group was ready to head out the door of Brueggers… although some headed out the back door and some headed out the front door. Eventually we were all on the sidewalk posing for a quick picture of the group before heading out for a run of up to 18 miles (give or take). 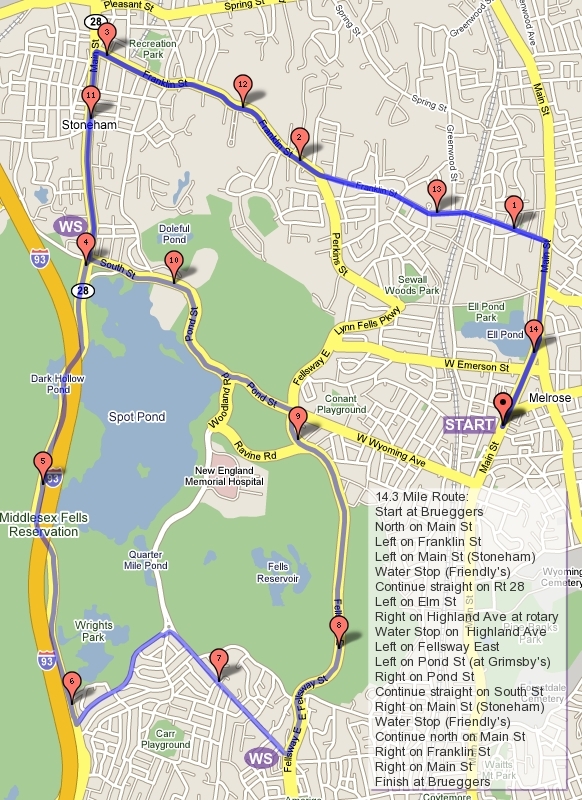 Part I – Expecting windchills down to the teens, a bundled up pack of about 16 runners headed up to Melrose Common and over to the scenic Swains Pond section of Melrose. The wind was at our back thoughÂ so sweat started to pour from underneath our winter hats. As we weaved back towards Main St through Malden a few gusts reminded us that although it was now Spring, it’s still New England. As we approached Main St, Nick ushered runners over to Erin’s car, where we drank up before moving on. Part II – Cutting across Oak Grove and through the winding hills of Glenwood St, once again it was proved that no matter which was you go in Melrose you’ll hit a hill. These short ones were just warming us up for the Fellsway East. From where I was on the Fellsway you could watch the pack spread out ahead of you rising to the crest of the hills ahead before sinking out of sight downhill as ifÂ riding a long asphalt carousel. This ride took up onto the LynnFells and over to “the knoll” where RickÂ awaited up with anÂ assortment of snacks andÂ drinks at the ready. Also there was Lois, battling a coldgoing around effectingÂ a different set of runners week by week. Get better Lois! Part III-Â With a SnickersÂ in our belly and GatoradeÂ wetting our lipsÂ we off to follow theÂ LynnFells to the other end. With the wind gently nudging us in the back we enjoyed the flattest part of the course for 3 miles, giving us a chance to relax before turning in to Breakheart. Before taking on that task we took a break with Nick and dropped off our hats and mittens. Part IV – Why did we drop off those hats and mittens? A cold wind found its way through the tall pines in Breakheart and hit us squarely in the face. An unexpected effect in what is usually an area protectedÂ from wind, wet hair and sweaty clothes made this a chilly surprise. We forged on through the steep hills and across th icy slicks crossing the path in several places. Returning to the parking lot at the end of the 3 mile loop we were greeted by a field of Easter eggs. This lone sign of Spring would soon be a frenzy of little children hunting for jellybeans and Snickers. Our hunt was easier, a short jaunt over to Nick’s car for the 4th water stopÂ of the day. Part V -Â Donning the articles of clothing we had shed less than a half hour ago, we made the trek back toÂ Melrose. This time the nudge from the wind seemed stronger and in the opposite direction,Â trying to keep us from making it to our destination. It’s been worse in the past few weeks, but this wind was coming later in the runÂ on legs that were more tired.Â Those legs got us there, back to Rick’s car and our last binge of candy and gatorade to supply some sugars for the ride home. Part VI – One last set of hills along the LynnFells and we were finally turning onto West Wyoming.Â The wind coming off of Spot Pond was blowing in our favor helping ur legs get us to downtown Melrose. Along the way, on the grass at the side of the street was an abandoned skateboard. I wondered which would be easier at this point, dragging myself through the last half mile or trying to ride a skateboard? It’s been 30 years since I’ve been on a skateboard so I opted to let my legs take me in on their own. Down Main St to Brueggers, another 18 mile run in the books, and we finished about 24 hours ahead of schedule! Have a good Easter to all who are Eastering tomorrow! Enjoy the jellybeans and Snickers you usually have to run 3 miles for.